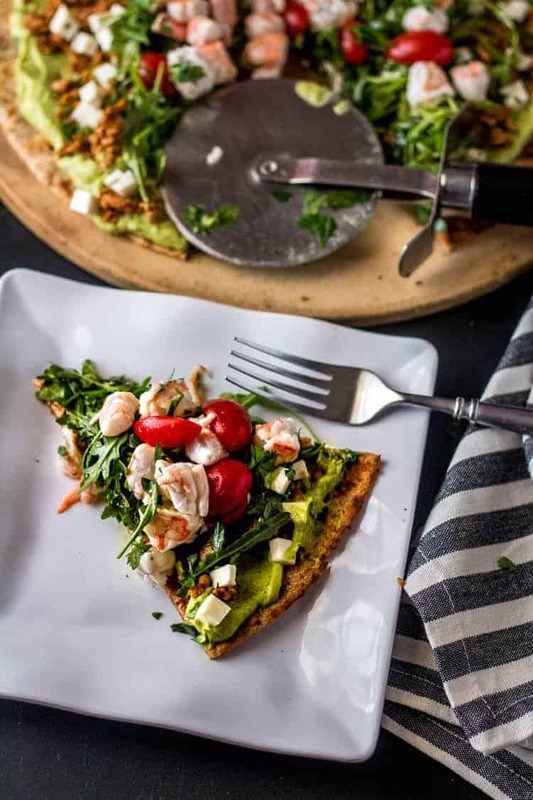 A grilled flatbread (or pizza crust) smeared with creamy avocado hummus topped with crumbled, lean chorizo and cotija, and the pièce de résistance – shrimp ceviche… Mexican Grilled Pizza with Shrimp Ceviche and Avocado Hummus delivers loads of Mexican flavor in a healthy, new way! Technically, it’s not summer (in the northern hemisphere) right? Living in the land of eternal summer – south Texas near the Gulf – I am prone to forget that! Summer begs for fresh, vibrant, non-hot foods. IMHO. Hot and steamy in the winter… Cool and crisp in the summer. Is there anything that beats shrimp ceviche on a hot day? 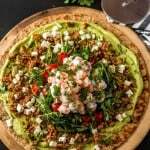 The short answer is “yes.” Shrimp ceviche atop a grilled whole grain flatbread that has been slathered with creamy avocado hummus, sprinkled with spicy, lean chicken chorizo and diced queso fresco, and garnished with a crisp arugula and tiny tomato salad takes simple but amazing shrimp ceviche to a whole new level! Grab a cold saison (or your favorite margarita), and enjoy! Have you experienced orange grease in a tube Mexican chorizo? That’s not really chorizo. 😡 That stuff is just pork or beef fat with annato/achiote for color and spices. Our less-than-authentic tacos growing up frequently had it fried up with ground beef for flavor. Moving to New Mexico opened my eyes to real Mexican chorizo made fresh with quality ingredients. I never looked back at that orange tube! When we moved to the Rio Grande Valley, I began shopping at Sprouts, and they have a house made chicken chorizo that basically has NO FAT. That’s a slight exaggeration, but I have to use cooking spray on my pan to keep it from sticking. And the flavor. Mmmm! The fresh chorizo is flavored with Mexican spices – cumin, coriander, Mexican oregano, achiote, cinnamon. The spices are combined with meat (pork, beef, chicken), garlic (of course! ), and chile powder (ancho, guajillo, chipotle). If you can’t find good chorizo at a local market, consider making your own chorizo. You don’t have to grind your own meat as in the Serious Eats recipe. You can simply knead the spices, and other ingredients into ground meat. I’ve made my own by grinding chicken thigh meat through my Kitchenaid, but I’ve also used packaged ground chicken. You want the flavor and lean protein… not the fat. I live near the Gulf of Mexico, and we have year ’round access to the most amazing shrimp. If you’re not confident in the quality of your shrimp, give it a quick poach (see recipe notes), then pop it into the citrus juice for 15 minutes. This isn’t a “5 Ingredient Recipe,” but it really does come together quickly. Think you’ll give it a try? 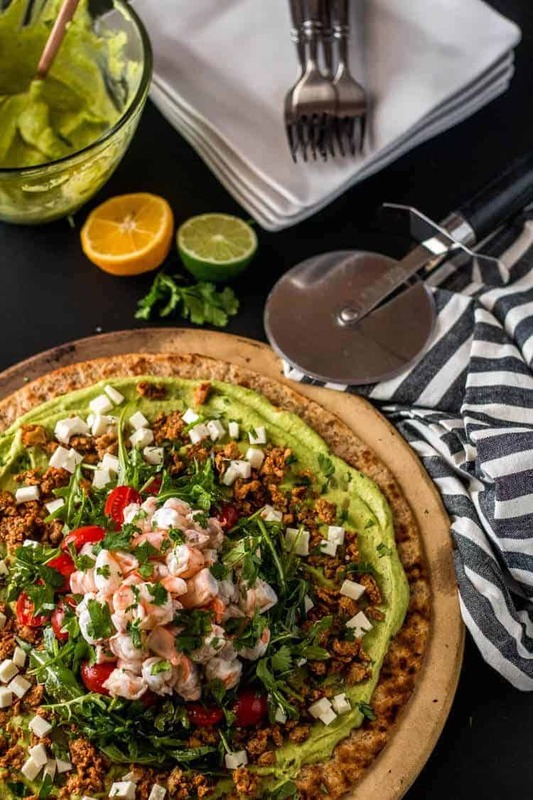 A grilled flatbread (or pizza crust) smeared with creamy avocado hummus topped with crumbled, lean chorizo and cotija, and the pièce de résistance - shrimp ceviche... Mexican Grilled Pizza with Shrimp Ceviche and Avocado Hummus delivers loads of Mexican flavor in a healthy, new way! Combine shrimp, citrus juices, and sea salt in a prep bowl. Stir to combine, making sure shrimp are covered. (Add more juice if necessary). Set aside for 15 minutes. Drain, reserving 2 tablespoons of the marinade for the arugula salad. 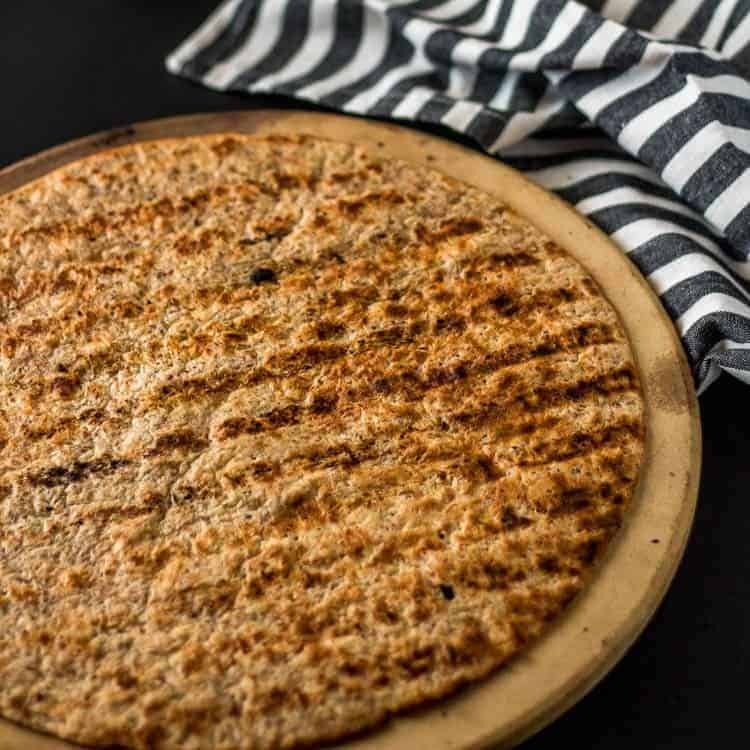 Go ahead and grill the flatbread/pizza crust if doing. This dish is served room temperature. No melty cheese here! Brown and crumble the chorizo. In a medium prep bowl, combine the arugula with the tomatoes. Toss with about 2 tablespoons of the citrus juices (leche de tigre) from the shrimp when it is drained. If you've not already done it, dice the queso fresco and chop the cilantro. I typically prep all my ingredients ahead (mis en place). Spread the avocado hummus on the flatbread/pizza crust. 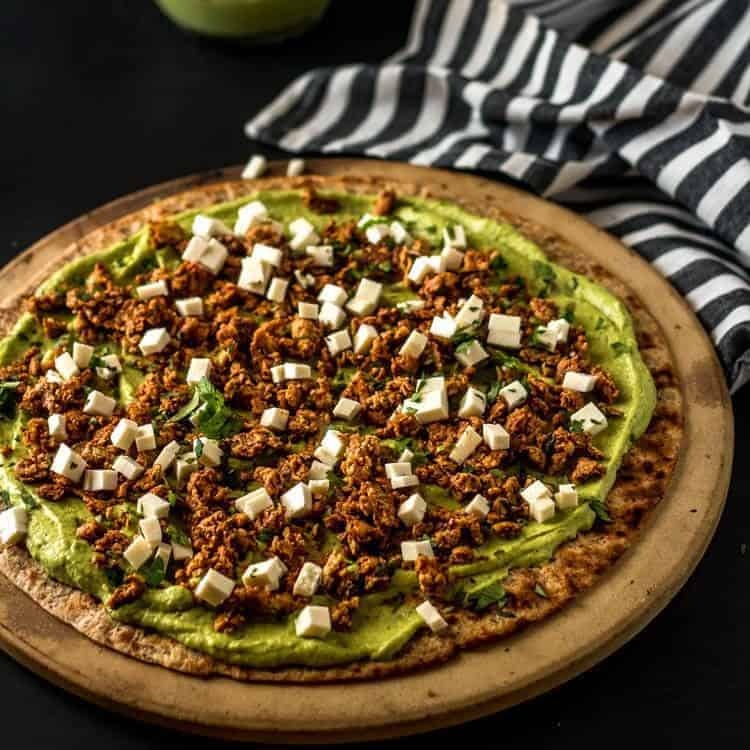 Sprinkle on the crumbled chorizo and diced queso fresco. Top with the arugula salad, and then pile on the shrimp ceviche. Garnish with chopped cilantro. Pour a "cold one," and enjoy! Living near the Gulf of Mexico, fresh shrimp are available year round. If you must substitute frozen, consider poaching them first. Bring the peeled and deveined shrimp and about 1 quart water and 2 tablespoons salt to a boil. Remove from heat. Poach 3 minutes. Rinse and drain. Proceed with recipe. I like using large shrimp (less peeling and deveining). Use the best quality you can find! Citrus varies a lot in juice yield. You need enough to submerge your shrimp - about a cup. I recently posted a recipe for Mexican-Inspired Hummus with Avocado. It's really easy to make, and requires only about 10 minutes and a blender. There are some commercially available avocado hummus brands, or substitute guacamole if you must. Macronutrients (approximation from MyFitnessPal.com): 416 calories; 37 g protein; 40 g carbohydrates; 12 g fat. WOW! What's not to love about this pizza! This is one scrumptious pizza pie - oh my! Just the other day I made avocado toast by whipping together avocado and hummus. What a great flavor and love seeing it on a pizza. Great recipe! It looks more complicated than it is, and the flavors are amazing together!